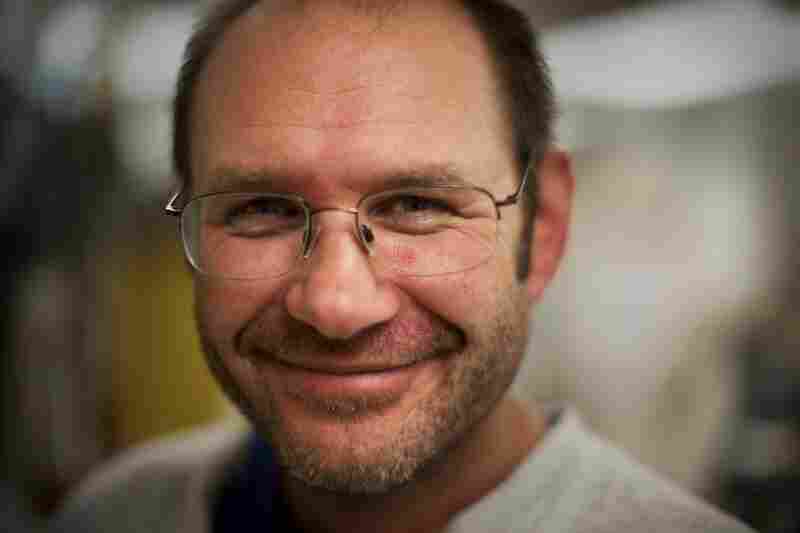 Smithsonian Taxidermist: A Dying Job Title Paul Rhymer has stuffed everything from giant squids to baby shrews. But museums don't need these skills anymore. After 25 years doing taxidermy in the place his father and grandfather also worked, Rhymer recently retired, and the Smithsonian has no plans to replace him. 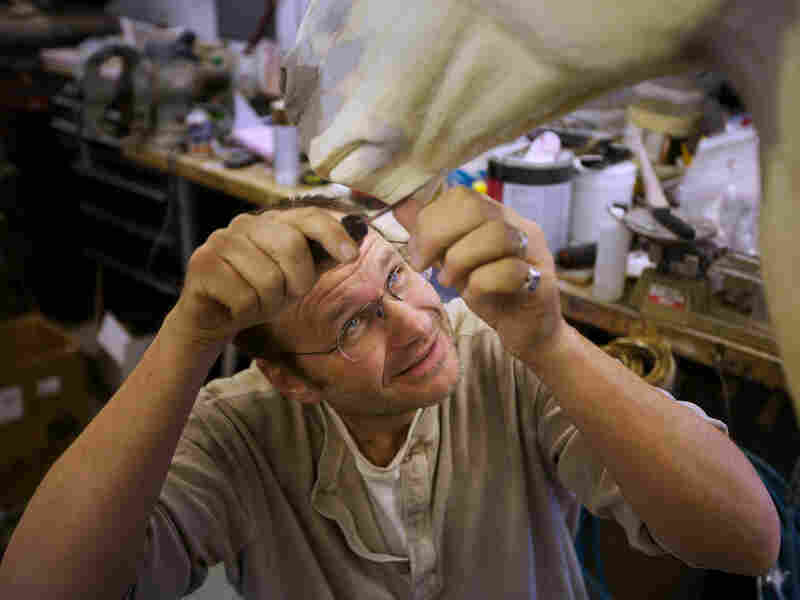 From snake milker to horse dentist, NPR reporters profile unexpected and unique professions. 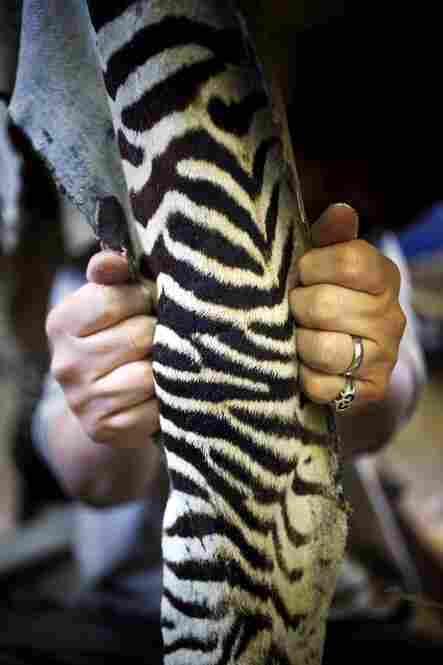 Paul Rhymer, the Smithsonian's last taxidermist, and his assistants sew up the leg of a Burchell's zebra. Rhymer worked for the Smithsonian for a quarter of a century, but the institution no longer needs a full-time taxidermist. 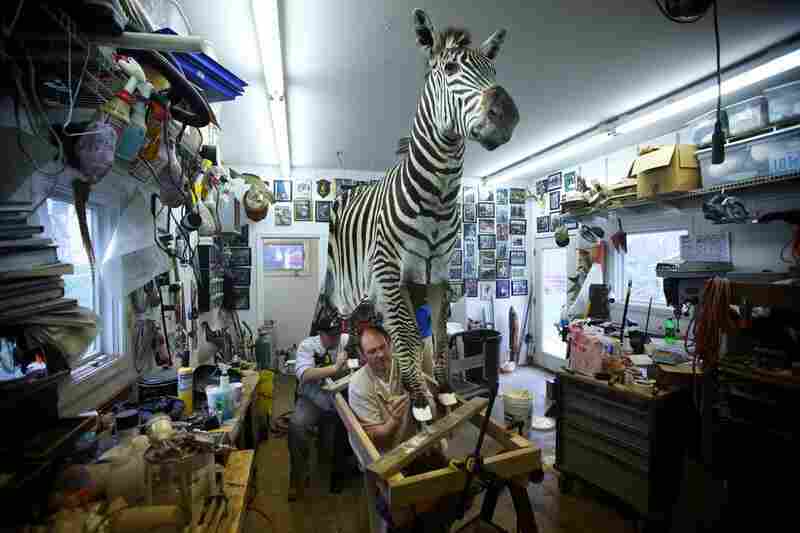 Working in his taxidermy studio in Point of Rocks, Md., Rhymer uses a knife to adjust the shape of the Styrofoam form on which he will mount a Burchell's zebra. 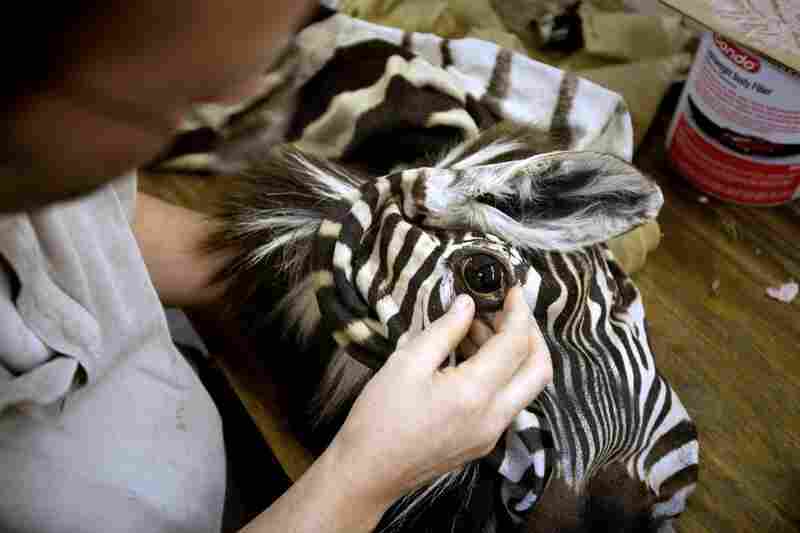 Rhymer tests the fit of a glass eye in the zebra skin he is mounting. 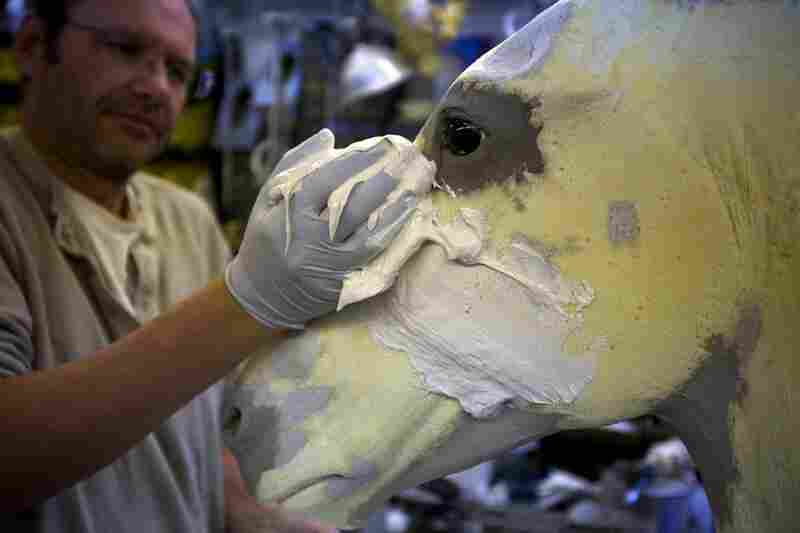 Rhymer applies a thick coat of glue to the face of the zebra mount in preparation for "dressing" the form with the zebra skin. 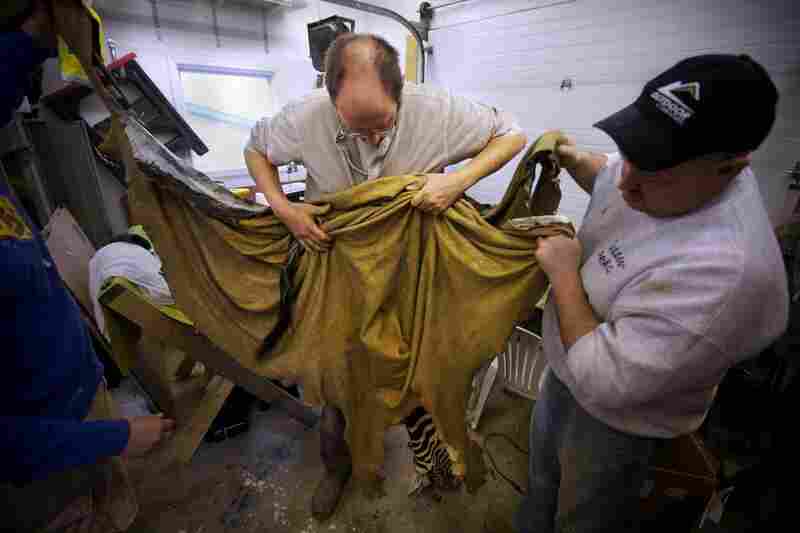 Rhymer and two assistants inspect and gather the zebra skin. The three men stretch the skin to fit the front leg of the Styrofoam mount. 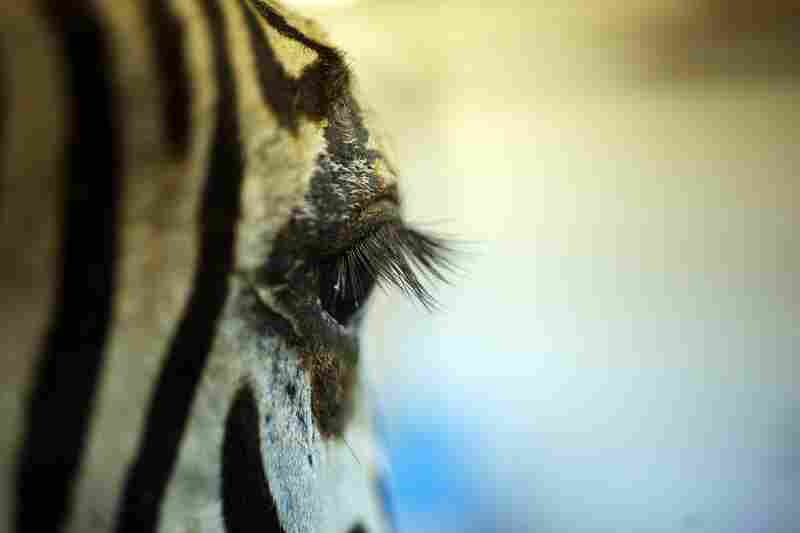 The zebra's eye, finished. Rhymer has stuffed everything from giant squids to baby shrews. Rhymer spent 25 years working as a taxidermist for the Smithsonian Institution in Washington, following in the footsteps of his father and grandfather. His last day at the museum was March 31. Every natural history museum worth its stuffing used to have a whole crew of taxidermists working behind the scenes. And many of the animals now displayed in the National Museum of Natural History's spacious Hall of Mammals date from that era, many decades ago. Paul Rhymer, the Smithsonian's last taxidermist, points to a panda crouching in a glass case. "That mount's probably 80 or 100 years old," he says. 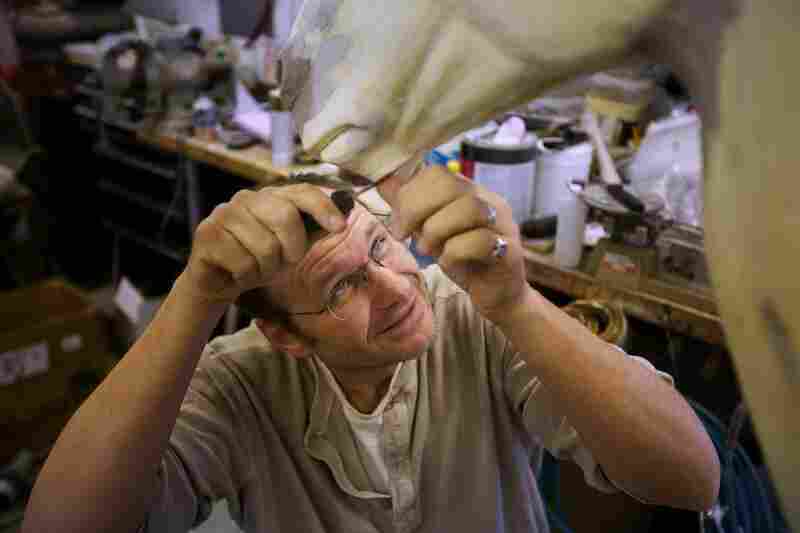 Paul Rhymer, the last Smithsonian taxidermist, just retired after 25 years in the job his father and grandfather once held. Rhymer's job tends toward repairing such mounts, especially when they're hard to find or endangered species like this venerable panda, which had been nearly falling to pieces. "The black hair had faded. The white hair had yellowed from dust and dirt from back in the day when you could smoke in the museum, so we literally took ... bleach and bleached the white hair," Rhymer says. He dyed the black hair, remounted the animal and fixed up the nose and claws. Many of these exotic creatures are themselves historic, such as a hulking rhino donated by Theodore Roosevelt, Rhymer says. "Right after he left the White House, he and his son went on a massive collecting expedition in East Africa for a year and they collected thousands of animals," Rhymer says. OK, "collecting" and stuffing animals may make some people squeamish. But Rhymer says taxidermists are nature lovers. Darwin had to learn taxidermy before he went on his ship the Beagle. It used to be how people learned about animals. Even in a time of Animal Planet and the National Geographic Channel, Rhymer says, there's still a place for mounted animals in museums. "I think there's something about the real," he says. "TV and ... the Internet cannot substitute, and I think taxidermy gives you that 'It's this tangible thing in front of you.' "
Rhymer's father and grandfather were Smithsonian taxidermists. And they showed him tricks he says are a dying art in museums. His tiny backroom workspace is filled with gorilla death masks, fake beaks and eyeballs, and grim little tools like a whirring wire wheel he is using to strip the fat from the corpse of a pintail duck. He then rinses the skin and twists it over the sink like an old washcloth. "People are always amazed you can do this to a bird skin," Rhymer says with a laugh. Rhymer has stuffed everything from giant squids to baby shrews. He knows how to work with outdated packing material like the thinly curled wood shavings known as excelsior and how to carve commercial deer mounts into shapes for wild antelopes and oryxes. But museums don't need these skills anymore, not in the way they used to. There's not enough work for a full-time taxidermist at the Smithsonian. Rhymer has retired from the museum after 25 years of doing taxidermy and model-making. The Smithsonian does not plan to replace him.